Fort Mill, SC – December 4, 2014. 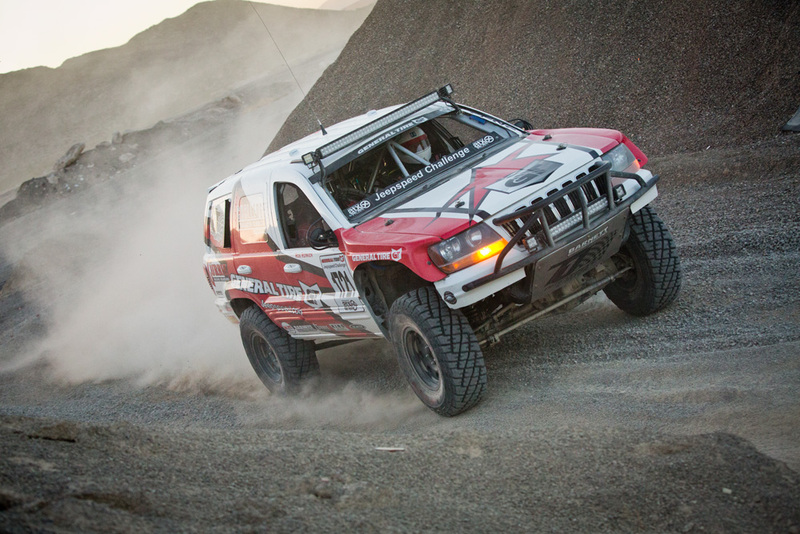 General Tire and Jeepspeed announced today that General Tire has agreed to a multi-year sponsorship to continue as the official tire of the Jeepspeed Desert Race Series beginning January 2015. Since 2008, General Tire has been the official tire of Jeepspeed with teams utilizing the famed GRABBER tire. The partnership has allowed Jeepspeed to offer its competitors affordable racing within the Best in the Desert (BITD) Series where budget-conscious racers can compete on the same race courses as the pros. Born from competition, the GRABBER tire is used by all Jeepspeed competition vehicles which are shod with DOT-approved 33” and 35” tires. Each race weekend team’s race on some of the roughest terrain in the US and the GRABBER continues to provide the traction, durability and performance needed for them to compete at the highest levels. These are the same tires consumers can purchase at their local General Tire dealer. 6 cylinder only with 33″ max tires. Suspension 10″ front travel and 12″ rear. Restricted Modified Jeep and Dodge SUVs and trucks. Jeep/Mopar V8 or 6 cylinder up to 6 liters. Forced induction ok on 6 cyl. Suspension 12″ front travel and 14″ rear. Open Modified Jeep and Dodge SUVs and trucks. Suspension 15″ front travel open rear travel. Shock size and number of shocks open. For detailed rules of the Jeepspeed Series, visit Jeepspeed rules. If you are interested in racing in the Jeepspeed Series, visit Jeepspeed.com for more details or you can send an email to jeepspeedcom@aol.com. Join in the conversation @generaltire, #AnywhereIsPossible. Continental develops intelligent technologies for transporting people and their goods. As a reliable partner, the international tire manufacturer, automotive supplier, and industrial partner offers sustainable, safe, comfortable, customized, and affordable solutions. The corporation with its five divisions Chassis&Safety, Interior, Powertrain, Tire und ContiTech generated sales of approximately €33.3 billion in 2013 and currently employs around 189,000 people in 49 countries.